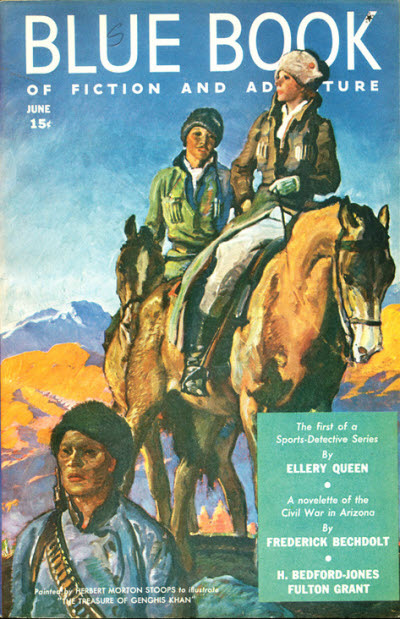 A simple piece of fluff interesting for the continuation of Ellery and Paula’s relationship, and for Ellery’s cross-over into the sports fiction genre, which was so popular during the 1930s, that there were several monthly magazines dedicated to it. Not only was this a murder mystery, but a Hollywood story, a sports story, with a tinge of romance thrown in. The cousins published four sports-related short stories in Blue Book magazine during the second half of 1939. Written at the same time they were scripting their weekly radio show, the quality of the stories is spotty. Interestingly, the “female interest” in the stories is gossip columnist Paula Paris, while at the same time, the “female interest” was Ellery’s new secretary, Nikki Porter. After traveling three thousand miles, he still gets pulled into a mystery. Not much of a mystery, but a mystery none-the-less. You can see how much Ellery has changed since 1929. Can you imagine the cane-twirling, first edition-loving, pince-nez-wearing Ellery of “Roman Hat” not only going to a baseball game, but being upset that he’s missed part of it?